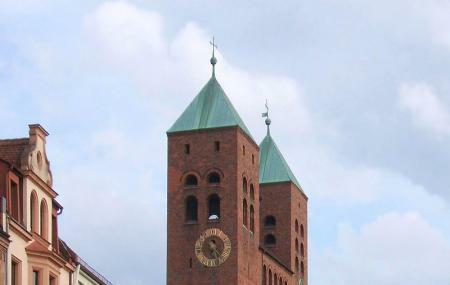 Find hotel near Gustav-adolf-gedachniskir ..
Gustav-Adolf-Gedachniskirche is an ancient church in Nurnberg. Named after the Sweden King Gustav II Adolf, this church was consecrated in 1930. It was rebuilt between 1944 and 1947 after being destroyed in the 1944 bombing. The church is built on the Romanesque basilicas of the 12th century. The tall church is built in bricks and is quite plain yet magnificent to look at. Except for the statue of Gustav Adolf, the church isn’t much adorned with anything. Visit this monumental church on a weekend to spend some quiet time. Try the best Nuremberg trip planner to visit this Gustav-adolf-gedachniskirche as well as many others. Fine Accommodation options like Best Western Hotel Nurnberg Am Hauptbahnhof, Hotel Agneshof Nurnberg, Hotel Marienbad and Intercityhotel Nurnberg will meet your requirement of where to stay in Nuremberg. Chalk out the best way to discover the city with Nuremberg vacation packages. Check out various modes for how to reach Nuremberg. Love this? Explore the entire list of places to visit in Nuremberg before you plan your trip. Fancy a good night's sleep after a tiring day? Check out where to stay in Nuremberg and book an accommodation of your choice. People normally club together Nuremberg Toy Museum and Schauaquarium Toxon Erlangen-buckenhof while planning their visit to Gustav-adolf-gedachniskirche. The Vesper Church is a wonderful project where people can spend their day there ,six weeks long from 10:30 till 3:30pm, chatting, drinking free coffee or tea , reading free newspapers and eating lunch for a symbolic price of 1euro..
Essen könnte viel besser sein,. Für ein Restaurant reicht der Catering nicht in der Qualität. Da würd ich es zurück geben .